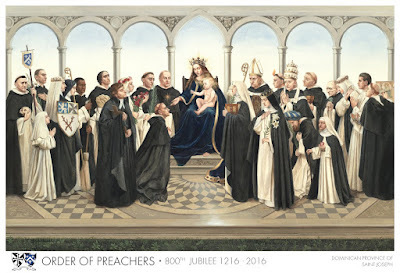 The Order of Preachers, or the Dominicans, is an Order of great lineage. Throughout its 800 years, hundreds of thousands of men and women had lived this charism, and hundreds have been enrolled in the Canon of the Saints due to their heroic virtue. The Order founded by St. Dominic in the 13th Century possesses a perennially relevant charism; one which has particular application to our own age. 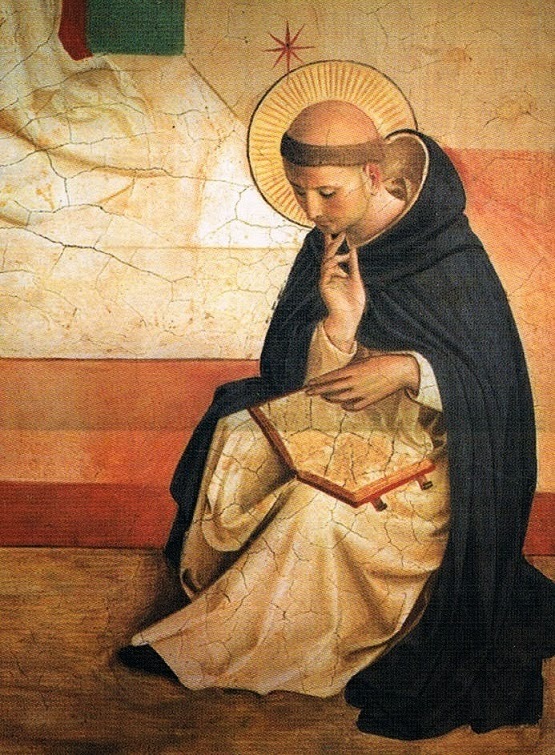 To see how this is so, it is helpful to look at the times in which St. Dominic lived. The beginning of the thirteenth century was a time of renewed vigour for Europe: commerce revived; towns grew up; cities like Paris, London and Bologna grew in size, power and influence. Democratic government was emerging. There was a new interest in learning, with the ideas of the pagan philosopher Aristotle and his Arab commentators beginning to fascinate the mind of the West. 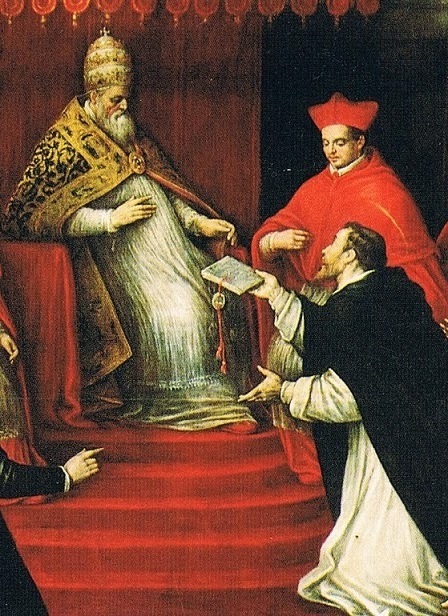 But it was also a time of corruption in the Church and distortion of the faith, despite the efforts of great reforming Popes like Innocent III. The new cities, materialistic, more educated and increasingly sceptical of spiritual truths, were too often served by an inept episcopacy and a body of clergy which was largely untrained. Nor were the monasteries able to have much influence since they were mostly rural and, by definition, isolated from the currents of daily life. There was, in the words of the prophet Amos "a famine of the hearing of the word of God", and the vacuum was frequently filled by superstition, heresy and an inordinate love for this world. Various attempts were made to respond to this dire situation. Canons, living in community around Cathedral churches, engaged in parochial and theological work. In a number of places, lay preachers attempted to return the Church to its early simplicity and pure gospel-fervour. But most such groups quickly fell into excesses and doctrinal error and had to be suppressed by the Church. It was in such a world that Dominic de Guzman grew up; the son of a Spanish noble; the quiet, serious student of philosophy and theology who sold his precious books to buy food for the starving; the young priest who entered upon the sheltered and studious life of a canon at the Cathedral in Osma. While still a young man, Dominic accompanied his bishop, Diego on a journey through southern France - a journey that changed their lives. The Church there was devastated. A heretical movement whose members were variously known as Manichees, Cathari or Albigensians, had successfully propagated a dualist doctrine that included hatred of all material things - even of the sacraments, - which were seen as the products of an evil god. In contrast to worldly Catholic clergy, the leaders of the Cathari were rigid ascetics who held their followers in thrall by their preaching and practice of extreme forms of penance. Dominic and Diego were moved to pity for the state of the Church here, and struck by the dismal failure of past attempts to bring back the multitude of the lapsed, a failure which had much to do with the inauthenticity of a clergy weighed down by wealth and pomp. Their response was to meet asceticism with asceticism. After toiling on for years, almost alone in the Albigensian stronghold, Dominic saw the need for a band of preachers who would be learned, disciplined and poor. With the approval of the Bishop of Toulouse, Foulques, Dominic began to gather a group of men willing to take up mendicancy and the dangers of preaching in hostile territory. They would be engaged in a full liturgical life and prayer, like the monks. They would be given over to active ministry in community, like the canons. But unlike monks or canons, who were bound to the one place, they would move about according to the needs of the Church, and they would preach, something hitherto largely reserved to the Bishops. 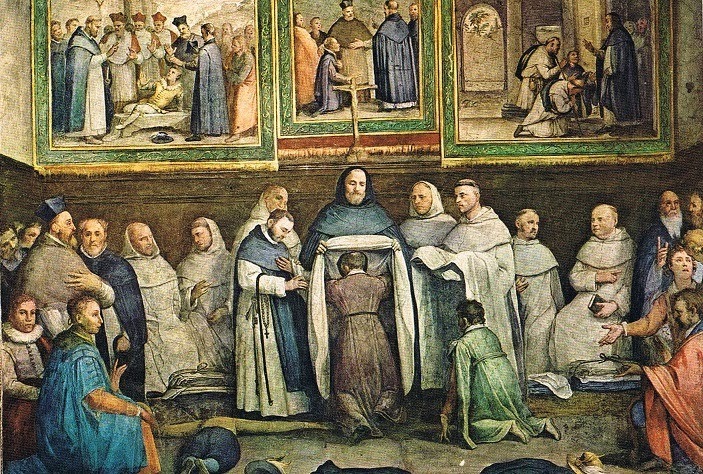 Even before his band of friars preachers gathered about him, Dominic had also established a convent of nuns (mostly converts from heresy), whose example and prayer would lend support to the campaign of his preachers. The plan of life of the preachers gained universal approbation in December, 1216. The Friars, up to that time a promising experiment in southern France, were now given wider scope, directly under the protection of the Holy See. And in 1217 Dominic took decisive action to ensure that the work of the Order would range as widely as the need for preachers did. After long prayer, he called his mere sixteen followers together and dispersed them, despite their objections that they were too few, too inexperienced, too poor and without enough leaders and friends. Dominic's reply: "Seed that is hoarded rots. You shall no longer live together in this house." He sent them off, - four to Spain, seven to Paris, two to Prouille and two were to stay on in Toulouse. He and one last brother went off to Rome. The seed was being scattered for harvest. By 1221, the year of Dominic's death, some 500 friars had spread as far as Hungary, Denmark, and England. By 1222 they had reached the mission fields of Poland, Germany and Hungary. Soon after, they were preaching the Word in Greece and Palestine. The story of the Preachers had really begun.